The Vale Resort is another of South Wales' stunning resorts and boasts a number of unrivalled facilities. 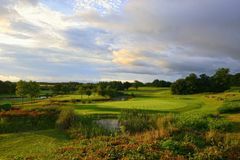 With 36 championship golf holes on offer, any golf fanatic will be at home at The Vale Resort as both courses provide players with both a unique and equally impressive golfing experience. On top of the golf, the resort is also renowned for its fantastic accommodation, luxurious Spa and delightful restaurants, meaning that even the non-golfers among us are able to enjoy a stay at The Vale. Found just outside of Cardiff, the lavish resort is easily accessible and more than warrants a trip down to South Wales. The Vale is among a select few golf resorts in the UK to offer guests two high quality courses. The parkland layouts that encircle the superb four-star resort hotel are a joy to play, giving wonderful variety to every stay. Stay and play at The Vale and you and your group of golf society will have the chance to tackle what is a genuine tour standard championship course – the Wales National. A par of 73 and a full length of 7,433 yards give insight into the challenge of this monster layout, but that’s by no means the end of the story. The Wales National is superbly conditioned, thanks in part to its USGA specification greens, and its collection of water hazards and acres of sand mean that trouble is never too far away. Long and challenging, yes, but the Wales National is a wonderful treat that every golfer will enjoy. As its name suggests, the Lake Course is dominated by water; in fact, a 20-acre lake comes into play on no less than 8 of its holes, creating plenty of drama and no little challenge. The signature 12th hole and its island green will make nerves jangle and will be a highlight of any round – many a tale to be told in the bar! Signature Hole: The 12th hole on the Lakes course is the signature hole with an island green, just like the 17th at TPC Sawgrass. The 12th hole is seen as one of the best holes in UK Golf. The four star hotel is built on ground that was once part of historic Hensol Castle estate - a 17th century stately home, set in an area of outstanding beauty. In spite of this, the resort itself is only a few minutes from the M4, and offers easy access into Cardiff city centre. Every aspect of the Resort has been designed to maximise comfort and convenience for every type of golfer. All rooms are air-conditioned, have lavish en-suite facilities and a large number of them afford spectacular views of the golf course and surrounding countryside. In addition to the luxurious accommodation, guests are welcome to take advantage of the first-class leisure facilities and the range of cuisine in the hotel's AA rosette restaurant. The exceptional leisure facilities available include:- a large-state-of-the-art-gymnasium with the very latest computer-aided fitness equipment, a luxury 20 metre indoor pool, fitness studios (offering a variety of classes including Yoga and Pilates), plus squash and tennis courts, sauna, steam room and whirlpool bath. For a more indulgent experience, you can visit Wales’ largest spa to take time out, chill and treat mind, body and soul in an atmosphere that stimulates the senses. Friendly, welcoming and informal is the standard order of the day. A large modern and bright lounge area provides the perfect setting to discuss that "missed putt" or 300 yard drive. Good wholesome food is available in the Clubhouse bar or for larger group bookings private dining in La Cucina can be arranged (set menu ) For an alternative dining experience the Vale Grill offers a best of Welsh menu and has recently been awarded an AA rosette. Had an overnight stay arranged with John Paul. No issues what so ever. Tee times were perfect and all of the details were immediately available to front desk staff at hotel, dinner bookings and room book in were very efficient. Thank you JP and your golf travel! Superb room, great cooked breakfast, welcoming staff and more than enough bars! As a resort - it was okay. Perhaps a tad bit on the stale side, there were more couples on romantic weekends than chaps on a golf weekends. Bars are a bit "functional" for my liking. As a comparison, I thought St Pierre resort in Chepstow is a better all-round venue for golfers. Rooms were pretty decent. The quality of the food was outstanding - far and away the best food we've had on a golf weekend. And probably the best pint of Guinness I've tasted in a long time as well. Overall score - reasonable. Good value for money. I'd probably return at a warmer time of year. As an added bonus, it was nice bumping into a few lads from the Welsh Rugby squad who were training at the resort. Great golfers break, and the deal was exceptional for the price. Lovely Hotel, good food, great facilities, very clean and tidy. Everything worked as it should. We got lucky and had a room overlooking 9th, 18th greens and 10th hole. We paid extra for the steak and it was worth the £5.00 supplement. We have just returned from our first hosting of a company event at The Vale Resort, organised by Your Golf Travel. On behalf of Corr Recruitment we would like to extend our sincere thanks to YGT for a superb weekend which was flawless in every detail...apart from our golf of course! From the pre-event organising, arrival welcome and all the way through to the final 19th hole cold beverage on the last day, the weekend went very smoothly and the service at The Vale was superb throughout. A particular mention to the clubhouse Bar Manager Ann, who looked after us all weekend and was impeccable with her customer service. There was a distinct lack of active wildlife during the weekend, very few birdies or eagles were seen, however the makers of any branded ball did exceptionally well and have probably seen profits rise in the last 4 days! In fact the only endangered animal would have been the poor ducks relaxing on the water that seemed to encroach on many of the holes and unsociably destroy a potential sub 70 round! Thank you again for everything you’ve done to make our weekend as enjoyable as it was and we look forward to booking our next event with you soon. I want to thank you for recommending this venue as an alternative to Celtic Manor as we couldn’t get in there. It was absolutely great and far exceeded our expectations in every area. We were even upgraded in the hotel to a wonderful room with a view over the 1st, 9th, 10th and 18th greens! Fresh fruit in the room was lovely and there was plenty of tea and coffee available too. The rooms were very clean on the whole and the bed was very comfortable. The restaurant was really good – we were given an allocation of £29 each to choose from the menu for our evening meal – and this was sufficient to have a starter, main and dessert. We both had sirloin steak and chips and it was probably the best steak either of us has had. The breakfast the next day was also excellent with plenty of choice and all very hot. The staff at the hotel from the reception to the restaurants were so very polite and helpful that we could not fault them at all. Now to the golf...again this was of the highest standard. There were a couple of temporary greens on the Lakes Course but it was all main greens on the Wales National. The Lakes is a long and sometimes quite narrow course which I thoroughly enjoyed. The Wales National is simply huge and was certainly a challenge compared to the Lakes! Some of the par 4s are massive and the chances of us getting a couple of Stableford points were slim! That being said...we still loved it! The back 9 has a particularly pretty section with water, and the red dogwood at this time of year (February) was stunning. In addition, we spoke to several of the members all of whom were really friendly which is sometimes not the case when you visit such a resort. The Clubhouse was very good, the menu was not overly expensive and the quality of the food we were served was good. I would highly recommend this venue. It is also the training base for the Welsh rugby team so seeing the players was an added bonus! My rating would be 10/10. We had an enjoyable golf trip to The Vale where everything was first class except the weather with rain on day 1 and a washout on day 3! It was disappointing that the weather put a dampener on the visit but that cannot be controlled. We still enjoyed the two rounds though. Otherwise everything was as expected - ease of booking, check-in, accommodation, food, pro shop, golf courses and service all of high standard. Apart from the weather, the only negative was that on the first day buggies were not available for our 13:15 start as these had not been returned by the morning players. They were brought out to us as we reached the 2nd green though. We had a bonus in that the British & Irish Lions squad and coaches booked into the hotel on our second night! Well what can I say? What an excellent venue with two great golf courses, both superbly kept and presented. The clubhouse was excellent too; very welcoming and the service was excellent. The beer was great and well priced...food was great also. The hotel was great, with superb food and a nice atmosphere. If I had to have one gripe it would be the buggy situation. On arrival on Sunday we were offered buggies after being told during the booking process that they were not available on the Sunday. And yet there were none booked out when we got there! On the Monday, whilst we had 7 booked, they would only let us have 5 as there were nine of us and they expected us to play in 3 balls. That was the only damper on what was described as 'superb weekend - great choice' by members of my party. Many thanks to your golf travel - we'll be going again! Thank you for organising our golf trip to The Vale Resort. It all went very smoothly and here is my review of the venue itself. Having just returned from two days of golf at the Vale Resort, I can report there are two great courses, both in good condition, and with very welcoming staff throughout. The hotel rooms, food and leisure facilities are all fantastic too. This golf break was great value for money and we will return. Apart from the shocking weather, our trip to The Vale was excellent. The staff at the hotel and the golf complex were very amenable and made our stay very enjoyable. The meals at the hotel were far better than we expected too and we would certainly recommend this resort to friends, but perhaps in the summer. Many thanks for your help in organizing a very enjoyable golf break and I am sure we will contact YGT for any golf weekends in the future. We travelled to the Vale Resort over the Easter break (a group of four with handicaps between 21 and 28) and what a great venue it turned out to be. The resort has two golf courses; The Lakes and Wales National. Both were challenging, even off the yellow tees we played off. Beautifully presented with fast greens, blind brows and doglegs, as well as stunning scenery, both courses were a joy to play. The length, water and sand made things tough for our handicap range but it was very rewarding when you played well! The only negative worth mentioning was that the half way huts were mediocre for golf courses of this standard. Not a big issue. One key tip – do buy the course guides (£5 each) to give you a clue as to how to play the hole whilst on the tees for the first time. The clubhouse was great, with friendly staff and beers costing approx £4 a pint. A decent bar menu was available too. We also used the driving range and practise putting greens which met expectations. The hotel, its rooms and the members of staff were as you would expect for a four star establishment. The a la carte grill was a great place to eat in the evening and the breakfast buffet really hit the spot with all types of breakfast available. This was the first time I've booked a golf holiday for a group. YGT made the process easy even when we changed dates and added a person very late. Even before we settled on the Vale Resort, YGT came up with a series of very suitable options for our dates, budget and preferences. I was surprised how much effort they put in to getting it right for us. In the end it was a near perfect trip so 9/10 is fair. We would certainly consider The Vale again and I've already recommended YGT to friends. Most of the scores I would give are 9/10. Bar prices etc are what you would expect from a hotel of this standard. The National course is long and would suit the more competent golfer in my opinion. The only issue we had with the whole trip is that we had two double rooms and two twins instead of the four twins. Apart from that it was very good indeed. We returned from our golf trip to The Vale Hotel, Golf & Spa Resort just over a week ago and the fact that we are already planning a return trip in September (hopefully with larger numbers) should tell you how much our group enjoyed it. We have a mixed range of abilities amongst our group (between 6 and 25 h’caps) and there is no doubt that for mid to high handicappers both courses are very difficult, with plenty of water, plenty of trees and plenty of blind shots. However, they are also very enjoyable and the conditioning of both courses is fantastic. The service at the hotel was exceptional and they literally couldn’t do enough for you. One of our group (that would be me!) managed to leave his phone charger in the room on departure. A couple of days later whilst still deciding whether it would be worth the hassle to contact the hotel to get it back, the postman knocked on the door with said phone charger. Great stuff! The food was great and the room was fantastic. I’m sure they don’t all have great views but mine had a balcony overlooking the 18th green which was great. The price of a pint was expensive as were snacks if you wanted them, but having visited similar establishments, this was no more expensive than the norm. As always Yourgolftravel provided a great service and after just getting back from our 4th trip organised by them, I can guarantee a 5th will be following shortly. The golf courses at The Vale are in excellent condition, each offering a different test. The Lakes Course is shorter but accuracy is the key, whereas the National Course is much longer than your average course, but with some really interesting holes. Our 3 ball of 15-18 handicappers all shot sub 100 which really felt like an achievement!! The Hotel is excellent too. Food in the Grill was of a high standard and the Health Club is a great facility. Members of staff are friendly and helpful. Overall we’d give the trip a 9/10 - A great way to spend my birthday celebration and will definitely think about returning in the near future. The golf courses at The Vale were both very good layouts. The conditioning on both was very good; the National greens had been hollow tined before our last round but the green staff had done a good job and they continued to run pretty well. The National is a tough course...not for beginners I would suggest! Overall, the courses at The Vale were, in my opinion, better than other complex's I have been to including Tracy Park, Carden Park and Celtic Manor (exc 20 10). The staff at the Clubhouse were very good and very welcoming. The hotel rooms were excellent too; of a very good size, with large TV and an excellent shower...again better than other such resorts. If there was a disappointment about the golf break, the meals were it. The lunchtime bar meals were fine but the meals on the whole were not as good as other places mentioned above. Overall, The Vale offers excellent value for money. I will never forget our golf trip to the Vale Hotel, Golf and Spa Resort. This was our second annual golf trip that we booked with YGT. You guys are so easy to use and would recommend you to anyone looking to book a golf break. I emailed them a few months ago asking where they thought would be good for 10 guys to play a weekend of golf but also have the nightlife for the evening. They recommend The Vale and it did not disappoint! The resort was easy to find, just off the M4 near Cardiff. We started our first round on the Friday and unfortunately the weather made it very challenging, with rain and wind howling in our faces! The course was immaculate though, and good for our range of handicaps. Luckily the weather improved over the next two days. The hotel’s facilities were great too. Spacious, modern rooms, which are just a walk away from the 2 golf courses. We used the gym and swimming pool, but unfortunately didn’t have time for the spa. Breakfast and dinner were amazing, we all agreed with a buffet for breakfast and 3 course dinners. The staff were so attentive and friendly and the whole trip was great value for money. Mid range H/cap would be perfect here. Easy to navigate with good directions to each hole. Little busier than The national and, via a member, The Lakes is very busy on a Monday and Wednesday. Long slog, but also challenging and rewarding when club and swing were perfect! Highly rate this course. A truly magnificent course, beautifully crafted fairways and winter greens that would be the envy of many a course in the height of summer. An exceptional experience and a credit to all concerned. Overall the course was in great condition for the time of year. The National course is a solid test of golf and a very enjoyable round. Despite the time of year, it had been kept superbly - far far better than the poor standard of the Lake Course. Lot of doglegs on this course, perhaps too many. We caught this on a quiet day in November and the round took 4.5 hours. Allow a solid 5 in peak season. Perhaps best suited to handicappers 18 and under. Whilst I understand the need to add sand the greens to mitigate against the frost, the amount of sand on this occasion had rendered the greens unplayable. It was like putting on astroturf. Sadly I have to say this spoilt the whole round. I'd recommend playing this course in warmer months only. The course was okay, but I think the second course at St Pierre in Chepstow was a better quality course. Completely different to the Lakes course. Much more of a relaxed feeling to the whole golfing experience. Course in extremely good condition, green keepers were busy buzzing around - unlike the Lakes. This course is more challenging due to tighter fairways, and you are conscientious that other players are playing the course due to the tightness of the course. Greens were very slow, lots of leaves everywhere, due to previous days winds and rain. What a challenge. Some blind greens making it difficult for second shots. Maybe a description on yardage book would help. Fairways like carpets and greens true and medium pace. Lovely looking course. Just a brilliant experience. The easier of the 2 courses. We found the hill section a little unfair as we were both hitting good fairway shots that rolled off and ended behind trees. Very nice challenging course, plenty of water and shots to think about. Greens had a lot of feed on them and were very bumpy but all in all very good course. Lots and lots of trees, not as good as I had hoped. Brilliant course, shame about the greens and NO HALFWAY HOUSE, just a vending machine which didn't work! the layout of the course itself, not bad, wouldn't rush back to play it. the issues were the care of the course, very rough and leave everywhere which they don't seem to clear and the greens were awful. HALFWAY HOUSE! JOKE a vending machine which didn't work but still took the money. The reception didn't seem to care !!! we had a bit of rain & 40-50 mph winds so conditions were tough. not worth getting a buggy if you have to stick to the paths hense the slow round. we were hoping for a half way hut for something to warm us up but unfortunately all they have is a vending machine that was out of order. would love to have another crack at this course on a sunny day. also the 18th is a bit of a let down hole compared with all the others, but nice in a way to finish on an easy par 4 after so many tough holes.